All I want for Christmas is a trip to Avoriaz. 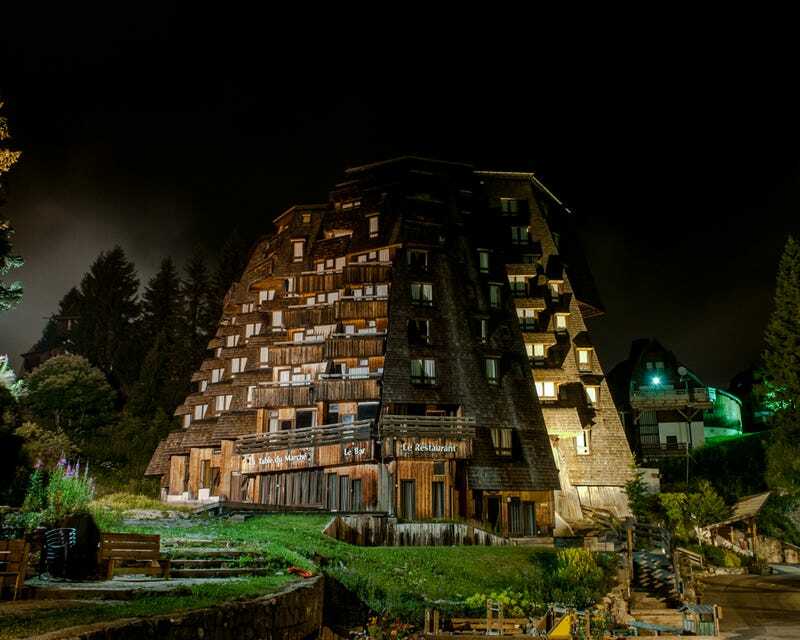 I had never heard of this place before finding it on Alastair Philip Wiper's site; the ace photographer has been documenting the French ski resort for years, and I've never seen anything quite like it. The more I read about it, the more I want to go. Avoriaz was built in the 1960s—the brainchild of Olympic downhill gold medalist (and local) Jean Vuarnet, who teamed up with a developer and brought on a trio of newbie architects—Jacques Labro, Jena Jacques Orzoni and Jean-Marc Roques—to create a somewhat mysterious, fantasy-inspired getaway nestled in the hills outside the town of Morzine. About a decade later, the resort inaugurated its own impressive (and sadly defunct) sci-fi and horror film fest, which is fitting because, damn, it looks cinematic as heck emerging from the foggy night sky, backlit by moody hues. The rustic weathered woods are a nod to a shingled style common to the area, but the incredible architectural geometry of these chalets and apartments is completely unique, and pure magic. In some images, the scale looks like these are homes for mad scientist gnomes on another planet; in others, it seems like a mountainous enclave of cozy super-structures constructed in the distant past or way far future. Wiper also snapped a winter series, as well as numerous black-and-white shots of the hamlet, which each offer a completely different perspective. Then there's this epic panorama on Avoriaz's official site, which shows the stunning surroundings. Un-freaking-real. I'd highly, highly recommend a jump over to explore Wiper's blog, which is like a where's-where of awesome visual tours. Visit CERN in Switzerland; see the Copenhagen Metro under construction; try to figure out what the hell is going on at the radio anechoic chamber at Denmark's Technical University (DTU); marvel at the Guildford Cathedral in England; and tons more. And, if you happen to be in Copenhagen anytime between now and the new year, you should check out Avoriaz: The Enchanting Village, an exhibition of Wiper's work at Bygningskulturens Hus (it runs until January 31st).